Download "L 2 : x = s + 1, y = s, z = 4s + 4. 3. Suppose that C has coordinates (x, y, z). Then from the vector equality AC = BD, one has"
1. 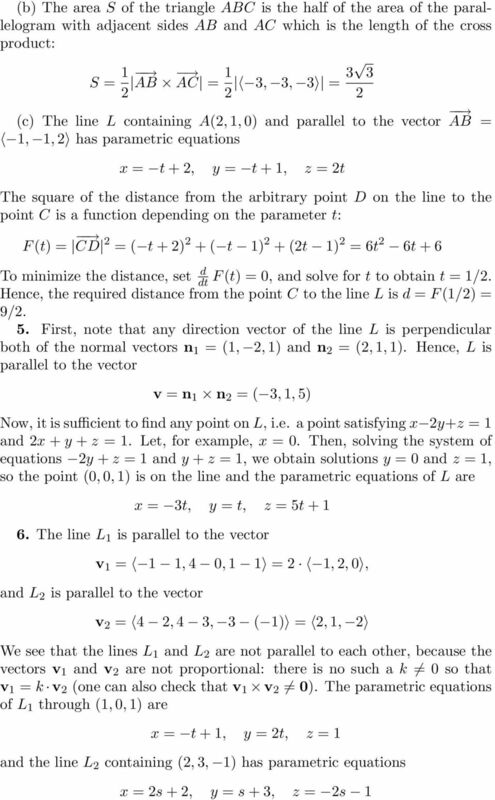 (6pts) Find symmetric equations of the line L passing through the point (2, 5, 1) and perpendicular to the plane x + 3y z = 9. Math 241, Exam 1 Information. 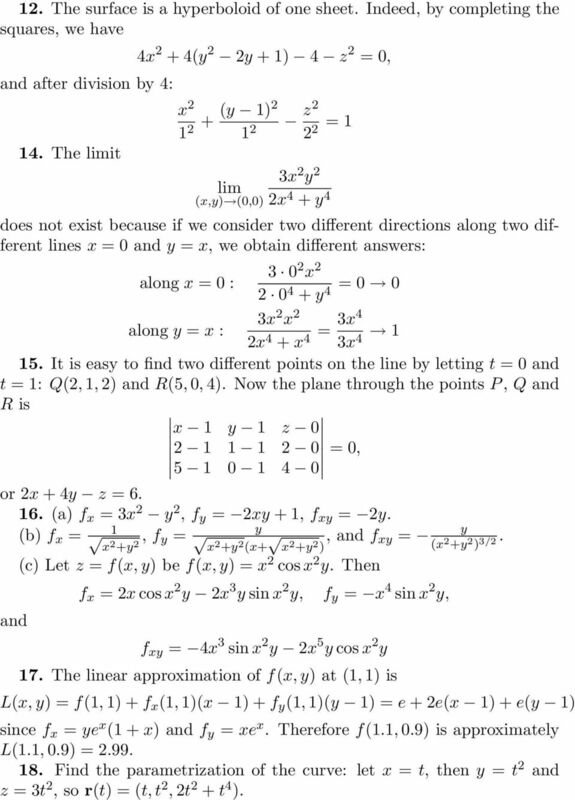 Section 13.5 Equations of Lines and Planes Generalizing Linear Equations One of the main aspects of single variable calculus was approximating graphs of functions by lines - specifically, tangent lines. Section 8.8. 1. The given line has equations. x = 3 + t(13 3) = 3 + 10t, y = 2 + t(3 + 2) = 2 + 5t, z = 7 + t( 8 7) = 7 15t. = y y 0. = z z 0. 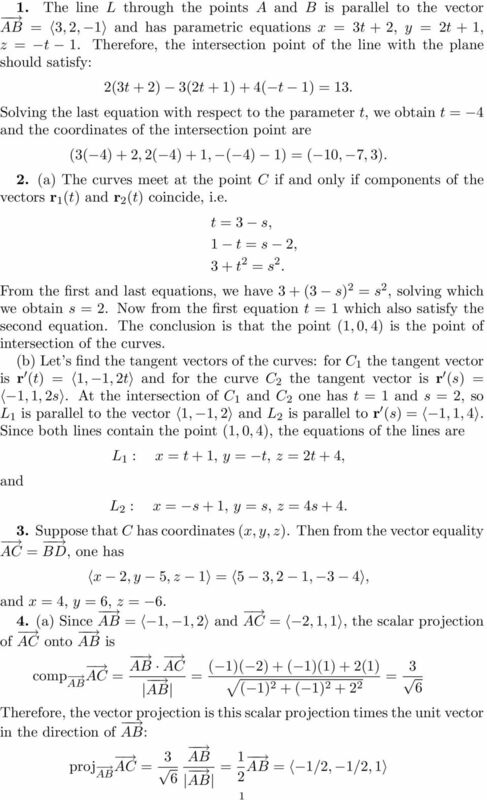 (a) Find a parametric vector equation for L. (b) Find parametric (scalar) equations for L.
Vectors, Gradient, Divergence and Curl. MATH 304 Linear Algebra Lecture 24: Scalar product. A vector is a directed line segment used to represent a vector quantity. C relative to O being abc,, respectively, then b a c.
Simplify the following vector expressions: 1. a (a + b). (a + b) (a b) 3. 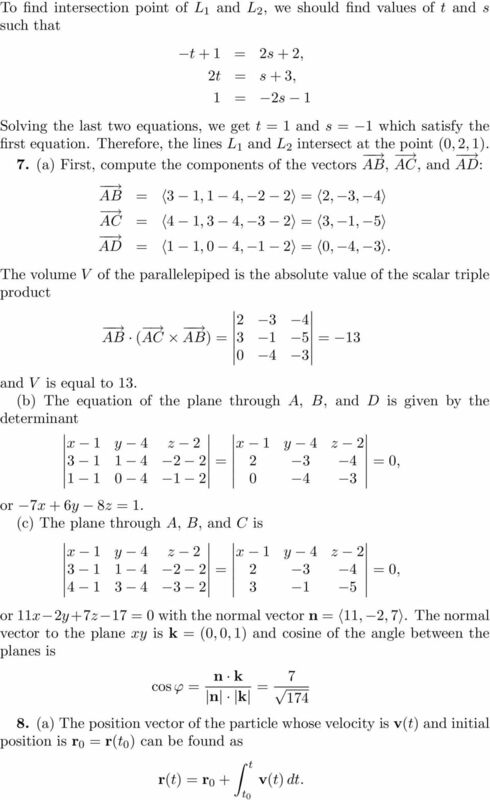 (a b) (a + b) Chapter 1 Vectors, lines, planes 1. Recall that cross product distributes over addition, so a (a + b) = a a + a b.
discuss how to describe points, lines and planes in 3 space. Problem Set 5 Due: In class Thursday, Oct. 18 Late papers will be accepted until 1:00 PM Friday. Definition: A vector is a directed line segment that has and. Each vector has an initial point and a terminal point. 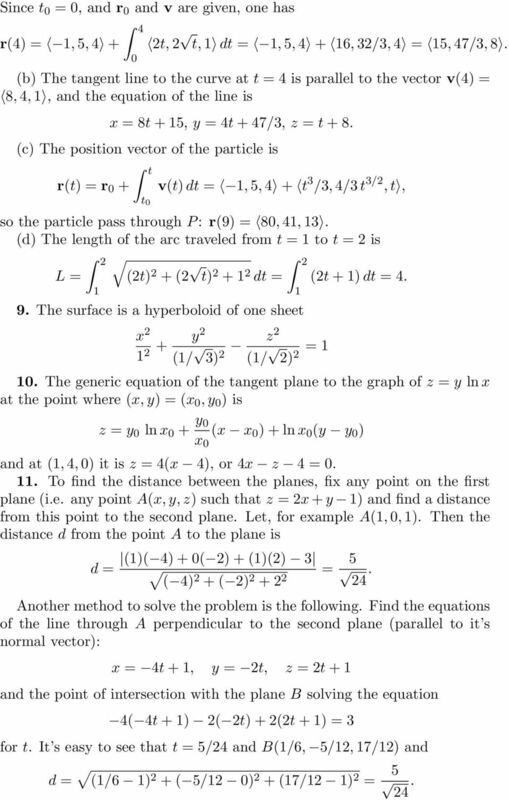 6.1 Vectors in the Plane PreCalculus 6.1 VECTORS IN THE PLANE Learning Targets: 1. Find the component form and the magnitude of a vector.. Perform addition and scalar multiplication of two vectors. 3. Bellwork a.) Write the line 2x - 4y = 9 into slope intercept form b.) Find the slope of the line parallel to part a c.) Find the slope of the line perpendicular to part b or a May 8 7:30 AM 1 Day 1 I. 10.5. Click here for answers. Click here for solutions. EQUATIONS OF LINES AND PLANES. 3x 4y 6z 9 4, 2, 5. x y z. z 2. x 2. y 1. Paper Reference. Ruler graduated in centimetres and millimetres, protractor, compasses, pen, HB pencil, eraser. Tracing paper may be used. Cross product and determinants (Sect. 12.4) Two main ways to introduce the cross product Geometrical definition Properties Expression in components. Definition in components Properties Geometrical expression.